Every day, 365 days a year, the New York Times cranks out more than one million copies of shoddy reportage also known as a newspaper. Entire forest have given their lives so that the New York Times might live lie. But that doesn’t keep them from chastising Americans for flushing toilet paper down the drain. In an article called “What Mr. Whipple Didn’t Say: Softer Paper Is Costly to Forests,” the Times reveals that Americans like their bathroom tissue thick, silky and soft as a baby’s bottom (so to speak). In their view, this makes you a bad person because millions of trees get wiped out just so you can wipe up. If you were simply willing to do your duty with, say, a dried-out old corn cob or a recycled Audi, those trees could grow up, get married, go to law school and live long, happy productive lives. Don’t take this sitting down. Begin recycling the New York Times by using it as toilet paper. You might even say that if you get behind the New York Times, the New York Times will get behind you. If you know what we mean. 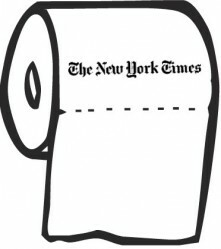 Personally I wouldnt even use the NYT to wipe with. I swore a few years back to never read or handle the New York Times, Time or Newsweek. So far my life has not been adversely affected. And just because the NYT says I should avoid it, I am going to buy a giant 20 roll package of the super fluffy toilet paper and then leave the bathroom door open so the cats pull it all off the roll and force me to flush it all down unused. In fairness, it all ends up that way, doesn’t it?